Here's an easy project for all ages. We provide the 5" × 7" cardboard and easel backs. You provide macaroni, glue, and paint. The student attaches a favorite photo to make the project complete.Makes a terrific gift for Mother's Day and other special occasions. Other ideas include mosaics, buttons, wood shapes, foam pieces, alphabet noodles, sand, glitter, felt, yarn, colored paper, stamp prints, and more. 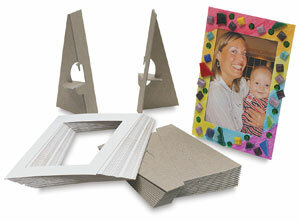 Kit includes 25 pieces of cardboard and 25 easels. Backing board is not included.